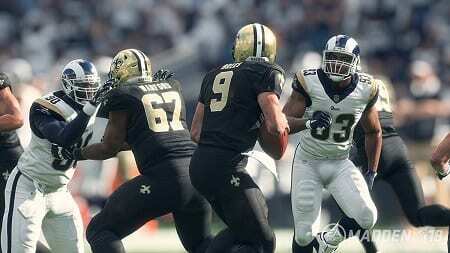 Madden‘s new target passing is anything but a… Brees. After six-plus agonizing months, the NFL is back, and that means it’s time for EA Sports’ signature franchise to make its annual return as well. Madden NFL 18 ushers in a new era of graphics via the Frostbite engine and adds a true cinematic story mode to the mix. We’ve long enjoyed the Madden control scheme, which is accessible to novices yet features significant depth for more devoted players as well, and that continues this year. There are multiple varieties of throws, moves to spring your ball carrier on offense and plenty of ways to bring them down defensively. After all these years, nearly every detail is fine tuned and responsive. With the focus on updating the graphics engine and adding the new story mode, there’s only one new gameplay mechanic of substance: target passing. Now you can hold down the left bumper when passing to bring up a reticule that you then manipulate with the left analog stick. If you’re thinking to yourself, “but that’s how I move,” then you’ve arrived at the first issue. Yep, using target passing requires you to stand still, thus allowing pass rushers to lock in. Unless you’re adept at the system it’s a great way to take sacks. To that end it’s unclear who’ll work to achieve that level of excellence given how difficult it is to try to track the target point downfield as it shrinks away. It works better on short and intermediate crossing routes, but the preexisting method works just fine and doesn’t require you to be stationary. Much like the short-lived passing cone, it wouldn’t be surprising to see target passing disappear over the next couple of iterations unless EA Sports can figure out a way to make it more viable. It’s completely optional, though, so it doesn’t affect our scoring. Moving to Frostbite creates the best looking entrant in series history, bar none. You won’t notice it that much when the camera is pulled back, but the replays and other presentation elements are impressive. There are some growing pains with the new engine, including awkward animations and some clipping when players get up after plays. Still, on the whole it looks and moves great. Traditional commentary remains about the same in Year two of Brandon Gaudin and Charles Davis, though we’re still in the Honeymoon phase given how stale what preceded it had become. Longshot, the game’s new story mode, features good work throughout with the Texas high school announcers bringing some comic relief to the proceedings. It’s an interesting story, stretching roughly five hours, though it’s worth pointing out that much of that time is spent off the field. Madden‘s idea to keep you engaged is to make otherwise mundane decisions — such as whether or not to play a trick on your friend or if you should stop and take a selfie — count in your ongoing scouting report. Gameplay segments are varied as well. Sometimes the game will ask you to complete quick-time events to pass a challenge, and at other times you’ll be tested with mini games (like 7-on-7 drills or who can knock down a series of targets the fastest). There’s also learning play terminology, doing media interviews and, of course, traditional football (usually via high school flashbacks). Considering it was the first effort, Longshot turns out to be quite well done. Still, it ends on a bit of a down note. The finale is a series of six challenges in which you’re graded based on your performance in various game situations. The problem is the computer calls the plays, and you can’t audible. At one point it called a QB draw from the 22-yard line with four seconds left. Really? We can’t check out of that and call something with at least a chance of success? So, yeah, we failed the challenge and got docked for it. Even with that, we finished with a 9.8 out of 10 grade… and were rewarded with being the fourth-to-last pick of the seventh round. Beyond the visual upgrade and Longshot, Madden 18 doesn’t offer much else new. Probably the biggest addition is “play styles,” which ostensibly create a different experience. Arcade is lots of big plays, simulation increases the importance of player ratings and incorporates injuries/more penalties, and competitive puts the onus on the gamer while removing injuries entirely — all online matches are contested under that style. It doesn’t feel like there’s a ton of difference between them on a per-snap basis, but at the end of games you can typically see the results. Speaking of snaps, you’ll be hard pressed to differentiate this year from recent installments with longstanding legacy issues (e.g., questionable reaction times from DBs, sloppy pass blocking) still left unaddressed. Franchise has a sense of déjà vu, and it’s once again clear that EA wants to steer players toward Madden Ultimate Team (MUT), the card-collecting mode loaded with challenges and — perhaps more importantly — ways to spend additional money to speed up the grind of improving your squad. We had more fun with it this year than in the past, but the interface could be friendlier. Without question, Madden NFL 18 is the series’ high-water mark visually, and Longshot is an interesting way to spend a few hours. If all you care about is the meat and potatoes of the game itself, however, you’ll likely find little has changed from last year. FIFA 17‘s biggest new addition is The Journey. Over the past decade, sports games have adopted RPG-esque traits, allowing a player to create their own character and work their way up through the system while earning XP and leveling up. Live ’16 is capable of looking really good, though it’s not consistent in that regard with the game’s more notable players seeming to have received more care than others. The ESPN license is used effectively, and the creation of that TV broadcast vibe is one of the highlights of Live’s presentation — that includes the enjoyable halftime/post-game shows that recap some of the game’s best plays. Animations can be a bit clunky but not to the point that it really pulls you out of the experience. Many considered last year’s PS4/Xbox One release of NHL ’15 to be a bit of an empty shell. While PS3/Xbox 360 players were treated to the usual complement of features, the next-gen platforms were given essentially a single-player tech demo.